CDR FoodLab® is the ideal method for performing quality and process controls, in real time, directly on food industry production lines. The speed and ease of use of CDR FoodLab®’s analytical methods become competitive advantages for food industries producing oils or fats, or that employ them as ingredients. CDR FoodLab® is the chemical analysis system designed and developed to provide accurate results at every step of the production process: the system is so easy to use that it can be utilized not only in a laboratory, but real time at the production plant for process control or quality control, even by staff with no previous specific lab tech experience. CDR FoodLab for Oils and Fats was last modified: March 6th, 2019 by CDR s.r.l. What is the CDR FoodLab® System? CDR FoodLab® is a self-contained equipment complete with everything needed to perform accurate chemical analyses for quality control of fats and oils. 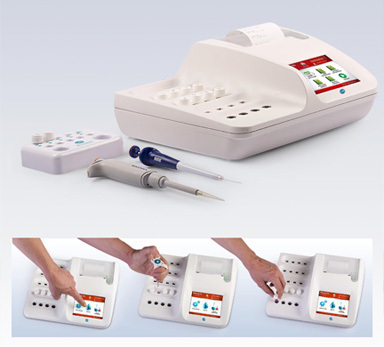 An analyzer based on photometric technology, available in two version, equipped with state-of-the-art LED emitters, reading cells and 37°C thermostated incubation cells. The analyser is supplied pre-calibrated, no further calibration is required. No maintenance is required. CDR FoodLab® is a true testing laboratory for fats and oils analyses, ideal to performe quality or process controls in real time, even directly on the production line. How are tests on fats and oils performed? Performing chemical analyses on fats and oils is simple and fast, because sample preparation, if any, is minimal. All reagents are supplied pre-vialed and ready to use, and operators do not have to handle toxic or carcinogenic compounds; there is no need to wash either containers or traditional glassware. CDR FoodLab® system is the ideal solution to run analyses on fats and oils for quality control and process control at production lines in real time. This is why it is used worldwide by many food industries that either produce fats or oils, or process them as ingredients. It becomes possible to quickly determine the shelf life of bakery products, snacks and creams with the utmost ease, by monitoring the oxidation status and the rancidity of the oils contained in the different products. If used in combination with the CDR extraction system, which operates without toxic solvents, the CDR FoodLab® system for fats and oils enables to assess the quality of either the raw ingredients or of the finished products of industries producing, processing or packing nuts and hard shelled dired fruit. Tests on marine oils such as fish oil and algae oil for nutraceutical or other purposes. Tests of vegetable oils, animal fats and fuel oils (biofuels or biodiesel). Accurate process control of refined oils thanks to special curves that work correctly even with very low ranges of acidity and peroxide value. The international reference laboratory Campden Bri has trialled the CDR FoodLab® to establish whether it could meet the requirements for analysing a number of important food quality parameters. assessment of the ability of the CDR FoodLab® to analyse for Anisidine Value, Peroxide Value and Free Fatty Acids content showed that the instrument gave comparable results to the reference methods with very high correlation coefficients suggesting good accuracy of results. CDR FoodLab® was used for a test to determine the p-Anisidine Value in two types of sunflower oils for a Comparative study on the oxidative stability of deep-frying oils carried out by the University of Hamburg: “Analyses of the oxidative stability of deep-frying oils”, curated by Katharina D. Placke, Jan Fritsche and Kim K. Kleeberg. Researchers relied on our instrument to determine the quantity of p-Anisidine in an easy way and with no use of toxic reagents to obtain rapidly a sound indication of deep-frying oil resistance. Norman Harris, Northstar Lipids Technical Manager: “Historically, Northstar Lipids relied completely on external laboratories for oil analyses. Both yearly costs, which were rather significant, and the delay in the results, up to 7 days, had to be taken into account to schedule production. 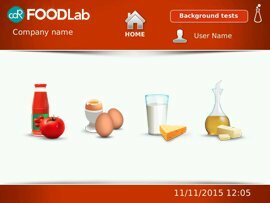 The CDR FoodLab® chemical analysis system for fats and oils can be configured to perform analyses on egg products, milk and dairy products, tomato derivatives and vegetable purées in general. in palm oil 10 *300561 2 – 100 I.V.